The meeting features plenary and parallel sessions, with an outstanding line up of speakers from around the world. This year’s plenary lectures will be presented by Janet Rossant and Kai Simons (sponsored by Garland Science). Janet is the Chief of Research at The Hospital for Sick Children in Toronto, and is a pioneer in the field of mammalian development and embryonic stem cells. Kai is one of the founding members of the European Molecular Biology Laboratory (EMBL) and a former Director of the Max-Planck-Institute of Molecular Cell Biology and Genetics, Dresden. He is a world-leader in the study of cell membrane organization and dynamics, introducing the concept of lipid rafts. 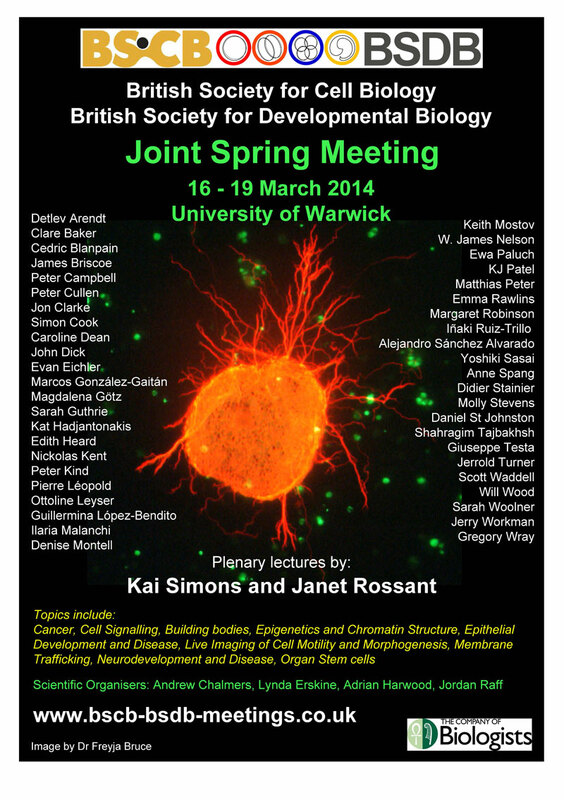 The meeting also includes the Hooke Medal, Waddington Medal and Beddington Prize lectures; a dedicated graduate student symposium; an ever-popular career workshop; several well-attended, lively and stimulating poster sessions and social events (including the now infamous annual “Pub Quiz”). The 2014 Spring Conference is expected to attract 400+ delegates, ranging from seasoned leaders in the field to first year graduate students attending the meeting for the first time. Please browse the website for more details about the conference, including information on registration, abstract submission, the scientific and social programme as well as details of our sponsors and exhibitors, whose essential support and contribution to the conference are very much appreciated. We hope you can join us and look forward to welcoming you to Warwick! This entry was posted on 04/04/2014 by administrator.